Gatwick to King’s Cross Station Taxi – Gatwick to King’s Cross station taxi – Book Gatwick to King’s Cross station taxi, To/From Gatwick Airport to King’s Cross station service & Get 10% off. 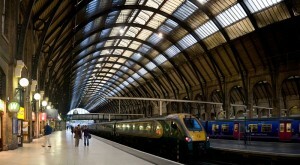 : King’s Cross Station was opened in the year 1852 and is situated in the northern part of central London. Being one of the most important railway stations in London, it is surrounded by many interesting hotels, restaurants and touristic attractions. To its celebrity also contributed the famous Harry Potter book series. Its most common destinations are Northeast areas and Scotland. Another great thing is that it is situated next to other important railway stations, like Paddington Railway Station and St Pancras International Station, which makes your travelling much easier. Nearby you can also find several entertaining means of transport: Bankside Pier, Thames River Adventures and Circular Hop-on Hop-off Trip – Crown River Cruises. If you want to take the time to visit the surroundings, make sure to pass by the British Library, the John Ritblat Gallery – Treasures of British Library and the London Canal Museum. You can do some shopping at Drink Shop & Do, Foyles St Pancras International and Sourced Market. A snack or a proper lunch can be taken at Yalla Yalla, Camino and Plum + Spilt Milk. If you want to enjoy a good drink, go to The Betjeman Arms, The Harrison or The Lamb. In order to get rail transport from London Gatwick Airport to King’s Cross Station, you will have to take the Gatwick Airport Train (every 20 minutes) and then just walk for 6 minutes using the St Pancras Low Level. You can also take the London Gatwick Bus (every 20 minutes), then the subway from Victoria Underground Station (every 5 minutes) and simply walk for 3 minutes, using the King’s Cross St. Pancras passage. The total journey would take about 57 minutes by train and 43 minutes by bus. Another option would be taking a taxi from Gatwick to King’s Cross. So as to travel by car from London Gatwick Airport to King’s Cross Station, you could take the A23 and the M23. Gatwick Airport is 29.5 miles away from King’s Cross Station. A journey by taxi from Gatwick Airport to King’s Cross Station Taxi with 247 Gatwick Airport Transfer is going to last around 1 hour and 39 minutes. The price for a London Gatwick Taxi to King’s Cross Station starts from 61 GBP.